Alphus Shaman original sketch up for auction! 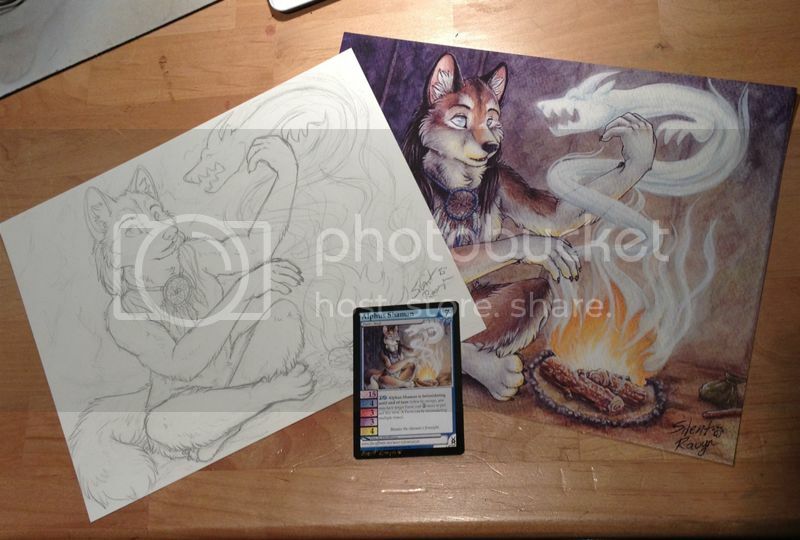 SilentRavyn is auctioning off the original sketch of Alphus Shaman, along with a color print and a copy of the card itself! A Shaman is known after they reach a certain age, when their powers start to become evident in the way they look at the world. Many factors that would be expected to matter -- family line, mental prowess, size, success -- never affected the way the power was passed down. When a Shaman's power comes to fruition, they are given a simple corded necklace that is said to help shape and focus their power. These are in honor of the necklaces that the Drachin themselves are said to wear to do the same task. The auction ends on the 8th! Don't pass this up! not bad item, but i prefer finished art. prelim sketches don't do justice to the idea, IMHO. I have to say, while I've always had a fancy for pencil lined art...the color on this one really brings it to life.